“The Way It Was,” 3/20/1967. Written by: George Tibbles. Directed by: William D. Russell. 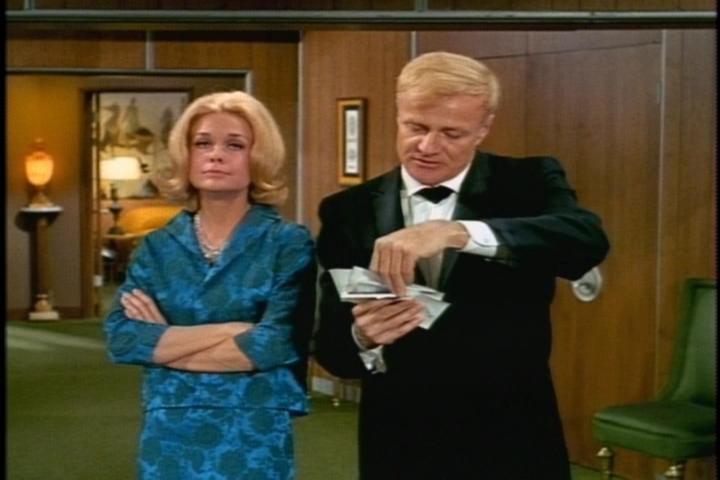 Welcome to another installment of Family Affair Friday! As our episode opens, Bill Davis is bringing a lot of work home with him. French knows that working from home is a bad idea–the kids have just started their spring break. Bill expresses confidence in French’s ability to keep the kids quiet. French’s doubts prove well founded, however. Soon Buffy and Jody are blaring the TV. 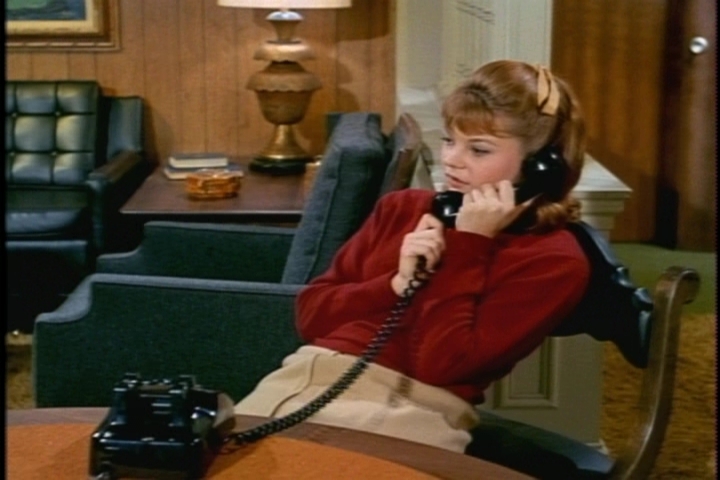 Cissy, meanwhile, is getting many phone calls and listening to the generically bouncy instrumental music that passes for rock and roll in 1960s sitcoms. Keep in mind: This is only the first evening of the kids’ vacation. When an old friend of Bill’s calls to recruit the kids for a one-week spring break camp, Bill needs no convincing. Soon he’s gazing dreamily into space as he contemplates a kid-free week. His camp director friend shows up the next morning to claim the kids, including Cissy, who’ll be serving as a counselor. “This is the part that’s the hardest–taking the kids away from their parents,” the camp director says, as French and Bill struggle to suppress their glee. Uncle Bill, of course, doesn’t plan to spend his whole week working. He’s anxious to get his date on. It’s amusing how averse all his old girlfriends are to domestic life. As he begins to miss the kids more and more, he subjects a series of women to dull parental bragging. His first date endures photos. He foists a Cissy composition on date number 2. Date number three flees after Bill starts showing her Jody’s trophies. After each failed date, Bill marvels at how much the ladies in his life have changed. The kids are having fun at camp, but Buffy is struggling over a letter to Uncle Bill. She’s just not sure what she should say. As the week goes on, Bill and French become increasingly concerned at the silence from camp. A camp, incidentally, that doesn’t have a phone. I think Bill has good reason for concern, especially since he didn’t research this camp in any way before packing off the kids. 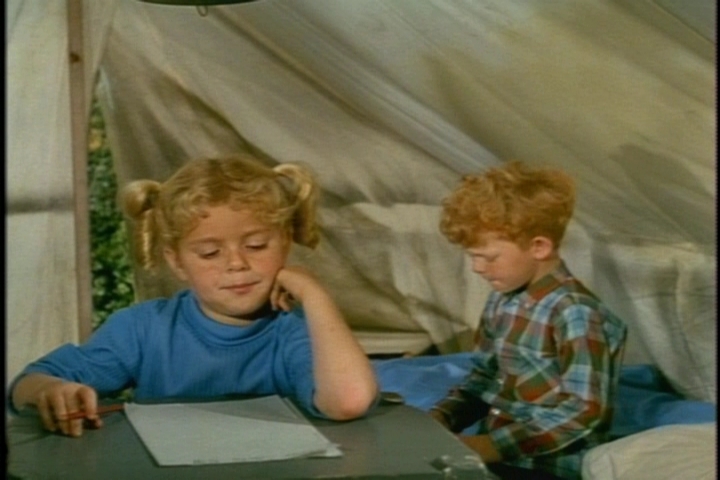 For one thing, the camp seems to have placed 6-year-old Buffy in a tent by herself. The peace and quiet in the Davis apartment soon becomes oppressive. 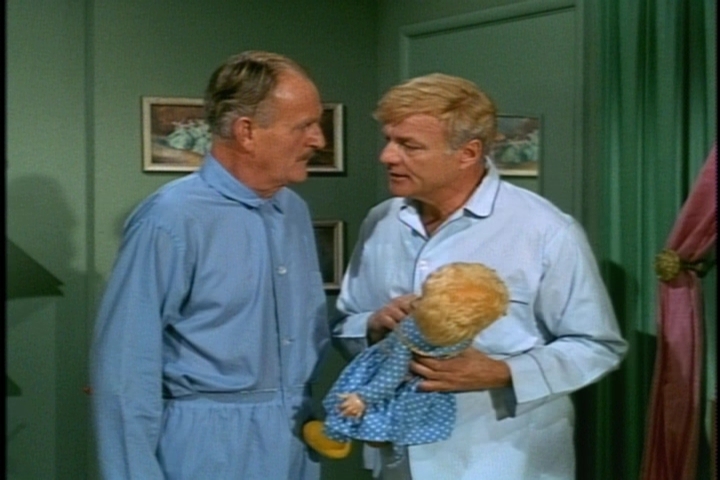 Uncle Bill is reduced to wandering into the girls room and cuddling Mrs. Beasley. Mrs. Beasley! French and Bill get a simultaneous brainstorm–taking the doll to Buffy would be a good pretense for visiting camp and making sure the kids are okay. Just as they’re ready to head to camp, however, the kids make a surprise return. Yes, the camp let some of its campers leave early without informing their families that it would be doing so. I can see why the camp director has to call old friends up one by one to recruit customers. When Bill asks the kids why they didn’t write, they note that they didn’t receive any letters. Chagrined, Bill and French realize that they spent so much time worrying that they forgot to write. Everyone is happy to be back together. Now, bring on the breakfast. 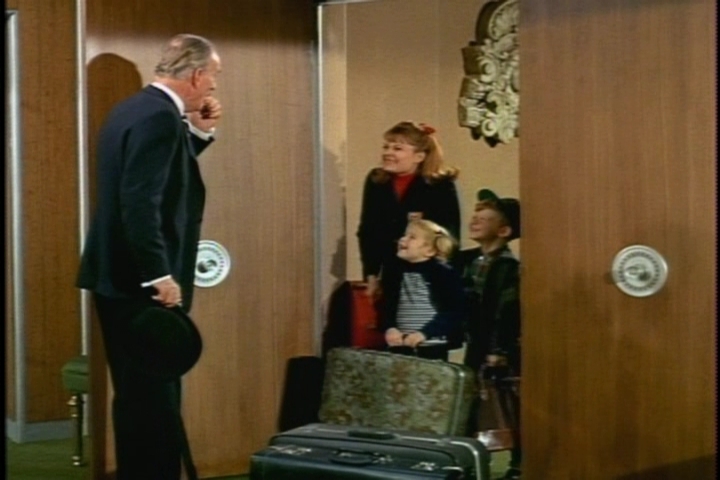 Uncle Bill’s early excitement about sending the kids away is pretty funny, if uncharacteristic. 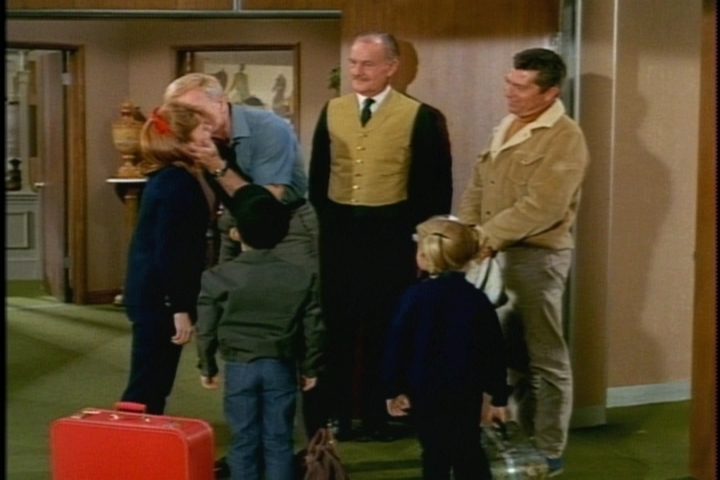 So is the kids’ pre-camp bad behavior, which is so over the top that I don’t really blame Bill for jumping at the camp opportunity, despite the kids’ history of separation anxiety and abandonment fears. Well, I don’t blame him too much. Each woman gushes about the details the French remembered. Bill fails to inform them that it’s a different French who’s setting the mood for romance now. In one scene, Bill and his date argue about the characterization of a child in the play they just saw. Bill feels that the seven-year-old character has been portrayed as excessively infantile. Coming from a Family Affair writer, this dialog is ironic. I think it’s a healthy sign that Buffy left Mrs. Beasley at home. (Buffy’s explanation: Mrs. Beasley hates tents). 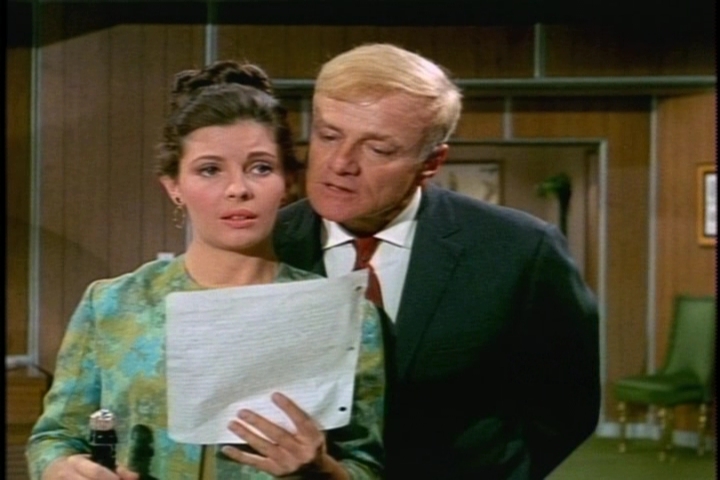 Borden was in the cast of the 1978 miniseries Centennial, in which Brian Keith also appeared. She played Barbara Baxter in the final season of Hazel. 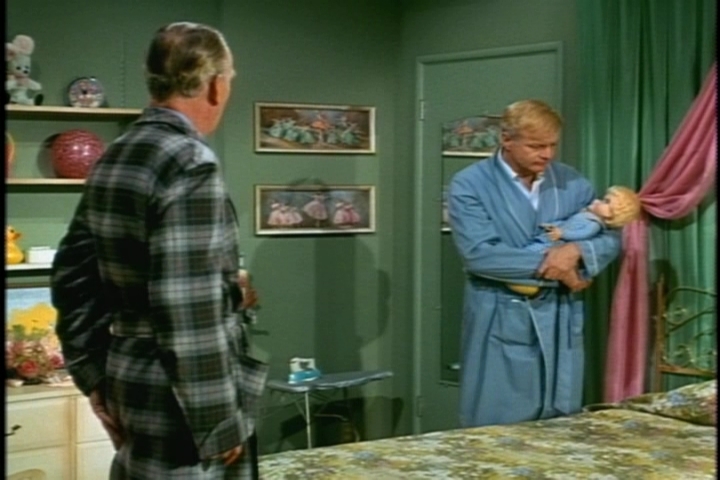 This entry was posted in Family Affair, Television, Uncategorized and tagged 1960s, Anissa Jones, Brian Keith, Classic Television, Family Affair, John Williams, Johnnie Whitaker, Johnny Whitaker, Kathy Garver, Nostalgia, Sebastian Cabot, Television. I think there is a second cot in Buffy’s tent, maybe for Cissy? French’s speech definitely typifies the American idea of stuffy British upper-class language. It makes a great contrast with Uncle Bill’s laconic, all-American style. There is another bed in Buffy’s tent, but I get the impression that Cissy’s counselor duties will keep her busy until after Buffy is asleep. I would imagine many 6-year-olds would be nervous about going to sleep in a tent alone. I’m probably just oversensitive to that issue after my real-life experience camping with Girl Scouts last week! I didn’t like French (Giles) at first because he was too servile to my taste and, as Cissy once put it, excessively “peppered his conversations with ’sirs’”. The whole notion of an English butler living in a New York apartment with his “master” in the 60s seemed to me very strange and extremely out of time, as did Central Park as the meeting place for all those British “Gentleman’s Gentlemen” and nannies who rather belong to Eaton Place or the Buckingham Palace. I began to like French much better after I saw Family Affair in English for the first time on YouTube 2 years ago (in Germany, all films and TV series are dubbed German). The English version, of course, not only puts on show the British/American language contrast I like hearing in practice (which could not really be properly transferred to German except by having French talk very formally, correctly and, as you aptly put it, stuffily), but also showed French’s funny side much more clearly. 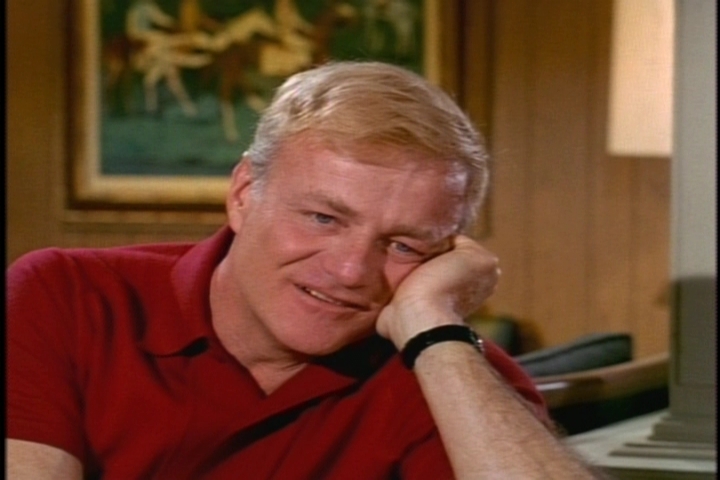 By the way, Brian Keith’s German voice – a pretty well known German actor at the time who also was Humphrey Bogart’s voice in ‘Casablanca’ – was a perfect match to Brian Keith’s acting, very warm and affectionate. Jody’s lines were spoken by a girl (!) who has become a very popular actress on stage and the small and big screens, now famous in particular for her leading role in a detective series. Your camping weekend with so many girls must have been pretty exhausting, particularly if you was all on your own and didn’t have any assistance in this responsible task. P.S. Please do tell me if you find my comments way too lengthy and drawn out! I would hate it if you were bored stiff by all this gibberish. I never thought about the humor inherent in contrasting American and British English, and how hard that would be to translate into other languages. 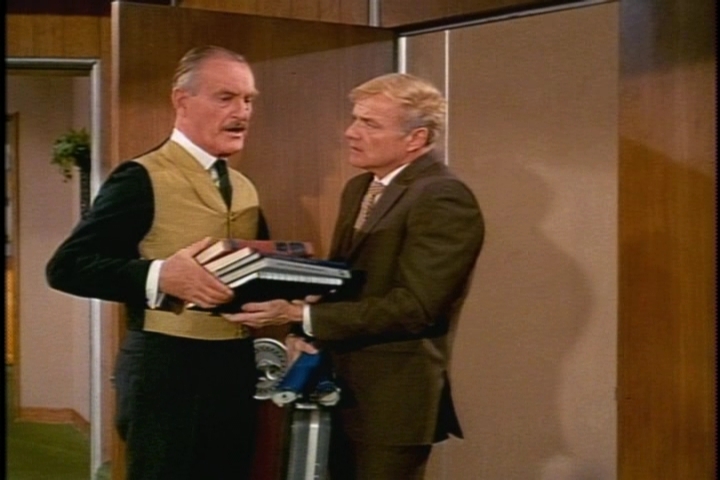 I think the “stuffy British butler” is such a familiar trope in American TV and movies that I always accepted the French character, even though butlers were WAY outside my personal experience. I’m glad they found an appropriate German actor to voice Uncle Bill. How funny that a girl played Jody. Please keep commenting! 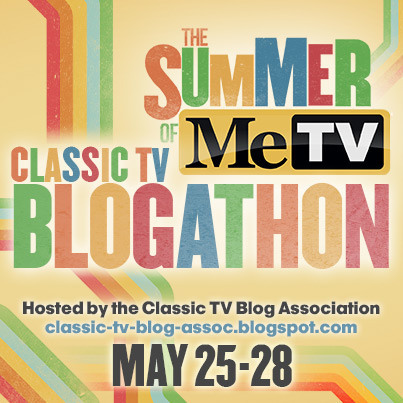 And if anyone else out there grew up watching the show outside the US, I would love to hear from you, too! Have I told you how much I look forward to this feature every week? I just love it! I’m really glad to hear that! Thanks for the kind words. Goodness me, no, I couldn’t write a guest blog post. My writing style is lousy, even in German, and I know nothing at all about blogging. To avoid blemishing your very excellent blog, I’d better confine myself to writing comments every now and then, perhaps go into further details (oh my! Didn’t I just say my comments are too lengthy?) on Germany-related topics, if you want.